The General Electric Turnaround: Why We Can’t All Be Jack Welch! Jack Welch is perhaps the world’s best known improvement guru. His transformation of GE not only took genius, it took guts and determination to convince a company that was doing pretty darn well that it had to do better. Not an easy sell! But he did push GE from “Good” to “Great” and became a legend in the process. In the 20 years that Jack led GE’s, revenues rose from $30 to $130 billion and company value went from $14 to $410 billion. Quite an impressive record! Not surprisingly, each of us would like to be the next god of corporate improvement, and follow in Jack Welch’s footsteps. That may not necessarily be such a good idea. First, those footsteps were made by some pretty big shoes. There are more corporations than there are genius CEOs. Second, the unique combination of genius and opportunity that drove Welch’s doesn’t come by every day. The uniqueness of Welch’s success was a reflection of the uniqueness of GE itself. Today’s blog takes a look at when we can and can’t apply the GE model. Whenever I hear a discussion about Jack Welch and GE, the discussion always turns to removing the least productive 10% of the organization. If you’re a one f the world’s super brands, replacing staff may not be a big issue. If you’re a smaller firm with less brand recognition, recruiting top talent from better known competitors may already be your greatest challenge. Let’s take a look at details of the GE transformation and see which parts of it are transferable to your specific firm! Are you a conglomerate of businesses? A really critical piece of information in understanding GE was that it contained a large number of essentially independent businesses. Before Welch arrived, GE operated a vast number of businesses. Not surprisingly, some businesses were not world leaders. Some might undergo improvement, but others would continue to be under performers…… perhaps because they were in markets with declining profitability. Businesses that were never going to be #1 or #2 in their filed had to go. And that’s just what Welch did. He sold or closed business units that could not be exceptional. If your firm is a conglomerate with many businesses, culling your businesses is a good place to start. Independent business lines can be closed without impacting other parts of the firm. If your firm only produces a single product (or a limited number of products) this may not work. Units within a larger business might be shut down, but that could affect its operations. You might outsource an expensive or unproductive process to reduce the drain on profitability. That’s a step in the right direction, but it falls short of shutting down a group; it especially fails to release management resources that can be focused on more productive product lines. Is there too much bureaucracy or too little structure? When you’ve worked in a big firm, you understand how crippling bureaucracy can be. Conversely, working in a smaller firm can mean negotiating and then developing new policies and practices every time a new situation arises. Clearly, Welch had to deal with an advanced and entrenched bureaucracy. Lifting this constraint was a key to his strategy. When Jack Welch took over GE when it had more than 400,000 employees spread around the world. Not surprisingly, that meant a lot of confusing and contradictory regulations and rules. But what if you are not one of the world’s largest firms? Instead of dismantling bureaucracy your firm may be focused on building it… writing policy, training staff, measuring adherence to standards, establishing gatekeepers, and installing controls. In a firm that is still in its early growth stages, or has recently gone through a merger or an acquisition, the process of establishing controls could be far more important than the elimination of restrictions. Most firms battle to do both, getting rid of restrictions where they are not needed, while adding them where they can be of value. Because GE was well established and self-satisfied, removing restrictions was more important to Jack Welch. For the rest of us, the removal of restriction is a slower process. Without the lure of a specific business plan, a corporate reformer has little leverage to remove barriers to productivity. You have the firm’s attention, where will you lead them? Welch needed to shake things up. GE was profitable, but it could be far more profitable. Welch’s actions gave a slightly drowsy firm a good shake. Not enough to harm, just enough to invigorate. Welch wanted GE to be #1 or #2 in every business, requiring an alert staff to deliver their maximum effort. Contrast this with managers promoting “change for change’s sake.” These managers want to see changes, but are vague about their goals and the rewards for those who deliver it. The result is churn without direction, and often without measurable results. No firm should settle into stagnation, but before you order a firm to rev up its engine, you need to know where you are headed. Without that direction, managers expend energy and workers work harder, but long-term goals are not achieved. Churn vs. improvement: As I said before, people most often remember Welch’s ongoing removal of the bottom 10% of their staff. Continuous improvement makes sense. Getting rid of lower performing workers makes sense. But cutting staff without a well-defined plan doesn’t make sense. Before you start cutting staff, you need the plan for the new organization. Individuals today who might not be considered the top performers might be the best for the new organization. Likewise, today’s top performers might not all want to be in the new organization. You need to define the new organization, and your staff needs to see that plan. When you go to the market for new employees, the best workers will be hard to find if your firm develops a reputation for arbitrarily terminating staff. If you genuinely want higher performing staff, you shouldn’t be too surprised if better performing workers cost more than their under performing predecessors. These costs can be dealt with in a business with rising revenues and profitability. But what if you don’t have a business plan that will deliver greater profitability? Approvals for higher salaries will be difficult to justify, and even harder to approve. Reward performance: If improvements are being delivered, what happens to the top performers? They get rewarded… a lot! While the bottom 10% is cut, the top 20% is heavily rewarded. The spectacular rise of GE provided money for rewards. If your organization does not significantly improve profitability, how will these performers be rewarded? When your staff (and the market) continues to work harder than the staff at competing firms, your best workers will leave. Of course, compensation is just one of the factors in worker loyalty. If your firm has a spectacular reputation, there is a value to having your name on a resume. Google is known for the world-class chefs at it (free) cafeteria, and for its other “social” programs. If you don’t have the top reputation in your industry or the best benefits, you can expect a higher premium in compensation to attract the best talent. A”BIG” business goal: Different improvement philosophies use different names, but let’s call this the “big idea.” You need a big idea in order to drive big changes. Even without a top-level plan, change can (and does) happen. But the degree of change will be more limited. Your plan will be stopped by more internal gatekeepers because they have not been told by their managers that your plan has priority over their role as “protectors” of the organization. Churn in staff: Every firm has a unique brand. The stronger the brand, the more you can churn your staff and still attract the best talent. But don’t just churn your staff, use turnover to move towards a new model. If you turn your group into a dynamo of productivity, but you have no new goals for your re-invigorated staff… you may just create boredom that undermines productivity. Reduction of bureaucracy: Lastly, you need to sweep away unnecessary bureaucracy so that the new organization can be agile and effectively pursue new opportunities. Rewards: Not just the top officers, but all the top performers who drove change needs to share the rewards. We can’t all be Jack Welch, nor should we all try. Jack’s model for change requires a powerful business goal that the entire firm can follow. Perhaps you can use just a small part of the GE model, but it is a self-supporting model that requires the support of more than a single business group to make it successful. When all of these elements work together, you just might be able to be the next GE, at least that’s my Niccolls worth for today! This entry was posted in Best Practices, Decision Making, Expectations and Rewards, Improvement, Continuous or Not, Project Management Office, Uncategorized and tagged General Electric, Improve, Jack Welsh, Project Management, Projects, Six Sigma, transform. Bookmark the permalink. 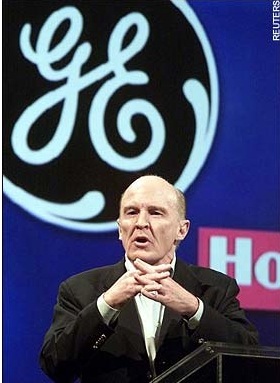 3 Responses to The General Electric Turnaround: Why We Can’t All Be Jack Welch! The name is Jack Welch, not Welsh. Thanks for that… I sometimes underestimate the dangers of auto-correct! Because we can’t all cook the books.